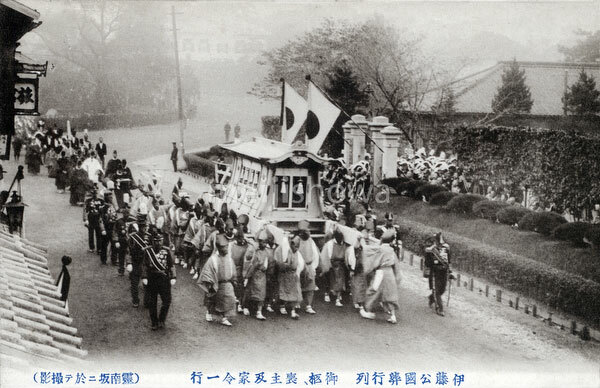 Funeral of Japanese statesman Hirobumi Ito (伊藤博文, 1841–1909). Ito was the 1st, 5th, 7th and 10th Prime Minister of Japan, genro (元老) and Resident-General of Korea. He was assassinated by Korean nationalist An Jung-geun (안중근; 安重根, 1879–1910). Ito’s funeral took place at Hibiya Park in Tokyo.